Hi Chuggers ! I am spotting plenty of Lychees at fruit stalls and supermarkets. This has to be the Lychee season right ? I love lychees… They are so juicy, refreshing and convenient! Just peel and pop into your mouth… Extremely addictive too! Lychees are great sources of Vitamin C, potassium and contain high amount of soluble fiber. I can’t tell you how excited I was to use Lychees in my green smoothies 😀 Generally, Lychees go well with most citrusy fruits and fresh herbs… So, a basic blend of Lychees with lemon juice and lettuce will give you an amazing, refreshing drink. But I love to introduce blends that give a more interesting flavour and you can leave out those ingredients that you are not fond of. 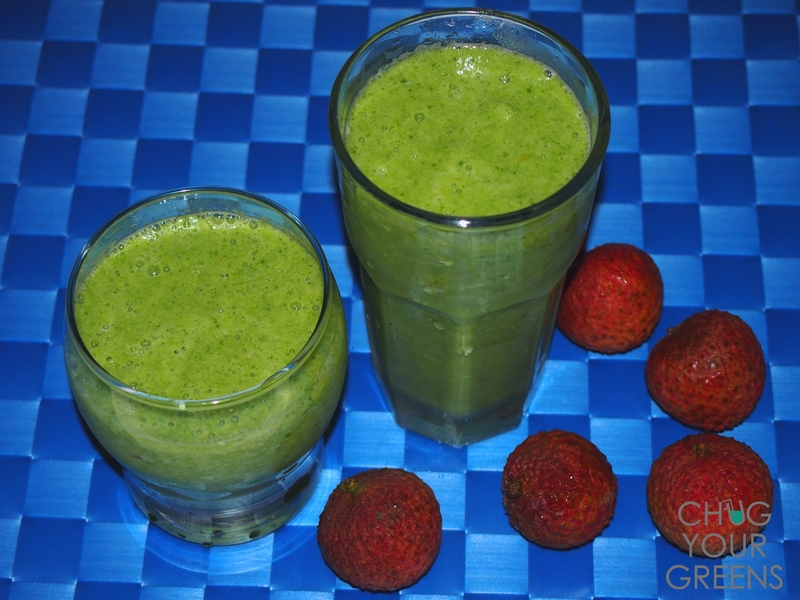 As my topic stated, Ginger is one major ingredient that I have added in this green smoothie. You can choose to slice it into pieces and add them straight into the blender, or, you can grate it first. 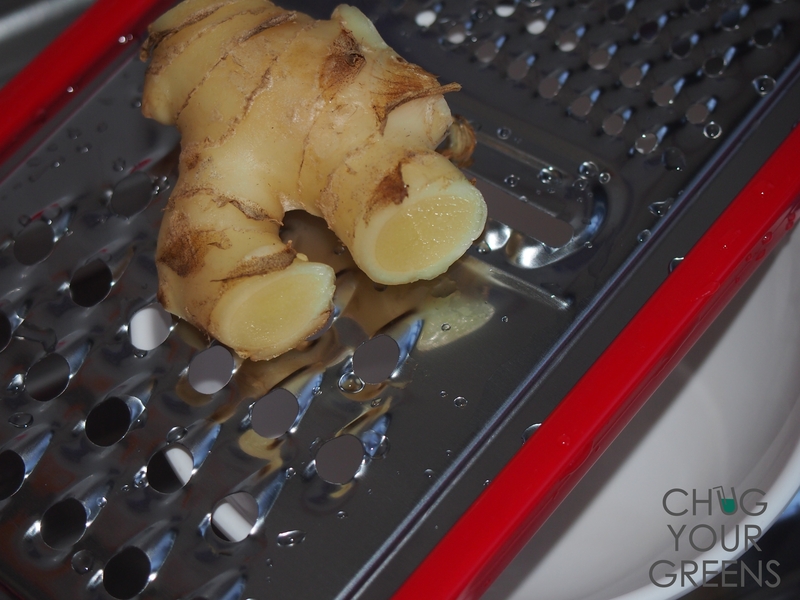 I find that grating the Ginger releases more of the flavour and I like that strong kick in my drinks. For this recipe, you don’t really need to add anymore water. 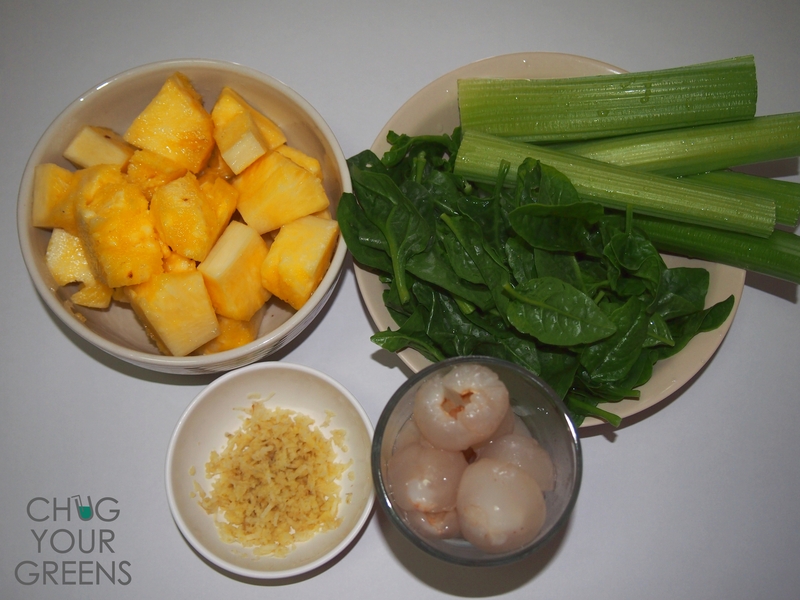 You can blend the chopped Pineapples and Lychees first and because they are so juicy, the liquid base is formed. Then, you can start adding in the greens to blend. The Pineapple and Lychees taste really good together. But if you want the taste of Lychees to be more prominent, just halve the portion of the Pineapple. This green smoothie has a crazy burst of flavours all in one (sounds exciting?) and it will be great for nursing a cold or sinus. When I get an allergy reaction, I always crave for something with Ginger (E.g. Ginger Tea, Ginger candies). It clears up the nose congestion, warms my tummy and always makes me feel much better. I would encourage you to switch around your fruits and veggies for your green smoothies, occasionally adding some herbs, spices or seeds. The combinations are endless and I personally enjoy experimenting with different ingredients in my blends. is there a replacement for the celery? For sinus and allergy issues, I have used a Neti pot in the past. According to Web MD, “The basic explanation of how the Neti pot works is that it thins mucus and helps flush it out of the nasal passages.” It may sound gross, but it has worked for me! I have also brewed a homemade ginger tea, simply by pouring boiling water over several ginger slices and letting it steep for 5 minutes or so. Add a squeeze of lemon for Vitamin C and a teaspoon of honey to soothe a sore throat.